Do you mean poor control in terms of discipline or ball control or both IM? These seem to be an enduring problem. I take it as positive we didn’t lose our heads and continued attacking. Probably recovering from two wins in row! Well Skolars proved most predictions wrong. Sounds a close game but a great win. We are now third. Who’d have thought? There’s a missed opportunity here. TWPs game against Sheffield at New River had 1200 present including a fair chunk of London based Canadians. Many (most?) of those weren’t die hard RL fabs but were happy to support a Canadian team. There are more French people living in London than Canadians. It’s a great shame a similar approach isn’t adopted for this. Exactly. That’s why I’m going. It’s an event - well tobe precise it’s an event in the Nu Camp in Barcelona. No problem at all. Very sorry I can’t be there. Have a great day. Checked with the club - you’re fine and your lad won’t be charged. Any issues ask for Tania, whose business manager. If you’re on Twitter check the clubs feed out as they confirmed little ones go free! Hi i can’t go tomorrow (I’m a ST holder). I really don’t think you will need too pay but will check and - worse case scenario - you can “have” my ticket (Richard). I live a lot closer and of course its near to Skolars (who are on White Heart Lane) and its really not that bad an area or that much of a trip from Euston or Kings Cross. My friend is a Spurs fan and is raving about it. I guess with the facilities you wouldn't need to leave that often. Thank you for posting this! I’ve noticed that most teams that visit us in London have a group of very very angry fans (mostly women I have to say). They vent their anger on the ref’s apparent inability to do anything other than award every single decision against them (despite our unnerving ability to lose). The level of venom is incredible (as are the volume and level of expletives used). My view is the game is a sort of pressure valve. They can let the bile out and leave in a state of calm mindfulness (saving the cat (wippet) from a kick when they return north) How do I react? Frankly I find them rather scary and I do worry about their blood pressure. In all seriousness if I had little kids with me it would bother me but my 30 year old son copes with it well enough (we are proud soft southerners). We just try to avoid eye contact. I’ve seen that. Handing leaflets out mainly I think. 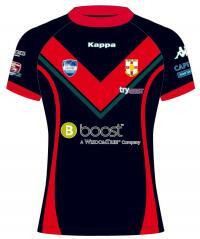 Skolars do this plus building community clubs and working with schools. Thing is it doesn’t seem to deliver new punters through the turnstiles. Need a bigger buz and media exposure. Great defending by Keighley though. There were a couple of times Bradford players took the wrong option on the try line. Bradford could have easily scored a couple more but in no way were Keighley outplayed. Nice to see a decent crowd too. Enjoyed the Cougar v Bulls game very much. Excellent coverage by the BBC and a classic cup tie. Feel sorry for Keighley but the right result in the end. Pleased Bradford are through and hope they get a SL team at home next round.